The kitchen is and presumably always will be the most visited and important room in any home. And there’s an easy way to explain this: the kitchen is the true heart of the home – it’s where the bacon is. Not only do people spend a good portion of each day in the kitchen, but whether the occasion is a taco night for the baseball team or having friends over for a couple cocktails, the kitchen remains the go-to-gathering spot for the majority of families. It is the most popular room for friends and family members to come together and break bread, and share stories and recent adventures. Every day in Eden Prairie, people always ends up in the kitchen! Our suggestion is to take the time now, while you still have it, to think through your design. Remember, your kitchen is the heart of your Eden Prairie home! Success in this endeavor is thought of as conceiving a satisfying space, and discovering “that sweet spot” between attractiveness, functionality, and physically comfortable to work in. We strongly emphasize function! No matter if you’re replacing old cabinets, remodeling your entire kitchen, or building a new home, avoid the discount centers and pre-fab cookie cutter cabinets and instead call the design professionals at Danner’s Cabinet Shop today at 763 753-4002. 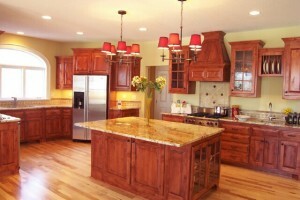 Be prepared to sit down with an experienced cabinetmaker and talk about the needs you have for your Eden Prairie home. We can mold your ideas into a cost effective plan that will accommodate all your needs and wants for today as well as tomorrow. With well over 40 years of kitchen design experience, Danner’s Cabinet Shop can share a great amount of exciting, creative and practical design solutions to suit any lifestyle and budget in Eden Prairie. You’re going to love how the kitchen in your Eden Prairie home looks when you have the best cabinets around!